Once all the colorful wrapping paper and ribbons are all picked up, it’s time to start thinking of the New Year ahead. Your child may not be ready for a big countdown at midnight, but that doesn’t mean they can’t participate in a few New Year’s activities for kids. 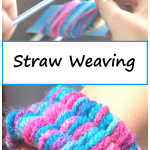 Kids of all ages will love this New Year’s Science Activity. 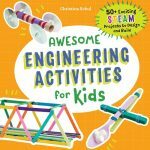 This simple fizzy science is perfect to do with the kids on December 31 as you count down to the new year, or on New Year’s Day. 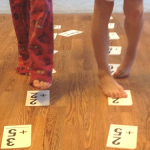 Be sure to check out our super simple New Year’s Game, too! Setting up this fizzy science is super easy. 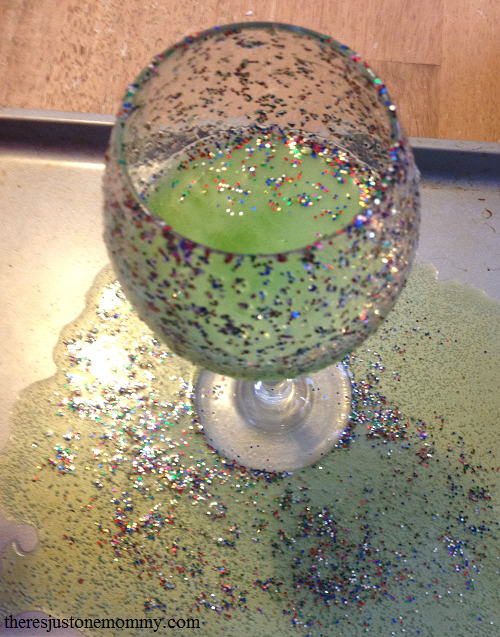 Start with a generous amount of glitter in the bottom of a wine glass or champagne flute. Next, fill a small, empty bottle with vinegar and a bit of food coloring. You could also put the vinegar in a cup, but the bottle makes it a bit more festive. When you are ready for the fun, place the glass on a tray or cookie sheet with sides. Once the children are ready, have them slowly pour the vinegar into the glass and watch the magic happen. As the glitter bubbles to the surface, you are sure to hear a few ooh’s and ahh’s. 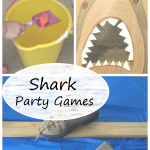 We have done vinegar and baking soda experiments many times in the past, and it is always a hit. 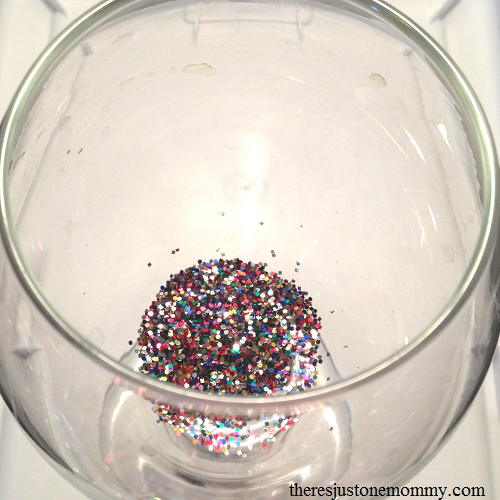 The glitter and fancy cup makes this one perfect for a kids New Years celebration. The kids will also love making their own confetti poppers! 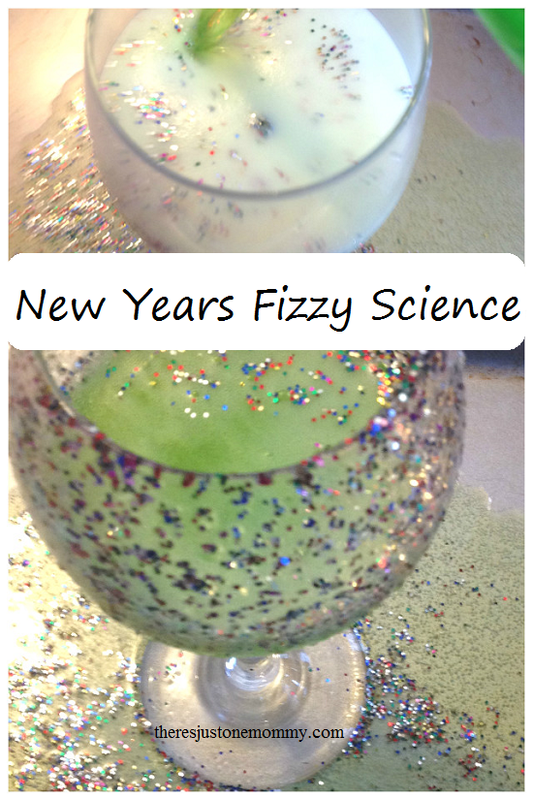 If your kids are anything like mine, you’ll be repeating this New Years fizzy science activity a few times. 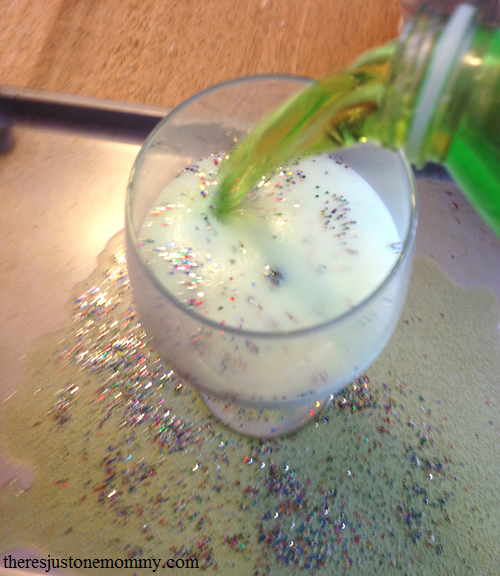 The addition of glitter to a tried and true experiment is a brilliant way to get kids excited about chemical reactions. Love it! Can’t wait to try it! This was one of their favorite New Year’s activities last year. Hope you get to try it!